Options Multi-solution effectively disinfects, cleans, and lubricates soft contact lenses. Its composition is highly similar to that of human tears, so it's gentle enough for sensitive eyes. The package contains one lens case for every bottle. 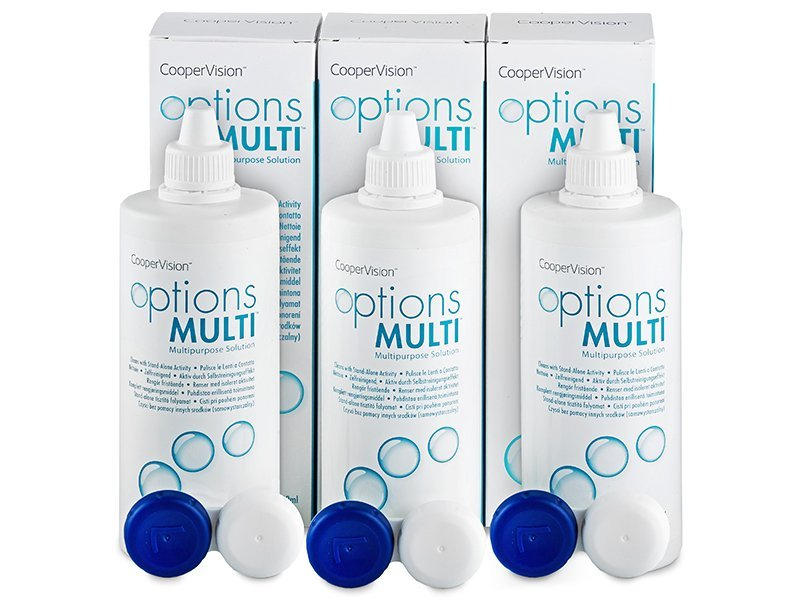 Options Multi Solution is a new product by CooperVision. Options Multi has an exceptional disinfecting, cleaning, and lubricating efficiency, and its ingredients are uniquely similar to human tears. As a result, it is gentle on even the most sensitive eyes. This package contains three 360 ml bottles with three lens cases. Use within 90 days of first opening the bottle. The solution contains two unique substances that will keep your contact lenses hydrated and free of debris. The surface-active substances have a double effect: They coat the surface of contact lenses in a layer of water that keeps them moist and repels debris. This guarantees all-day comfort. Options Multi solution cleans lenses and removes impurities without the need to rub the lenses in your palm before and after wearing. If not rubbed, the lenses must be placed in a case with Options Multi solution for at least six hours to achieve optimal disinfection. Most experts still recommend rubbing the lens in your palm with solution, as it is the most effective way to remove deposits. Please consult with your eye-care professional before beginning to use Options Multi solution. NOTE: We often receive inquiries as to which solution offers the best care for the new generation of silicone-hydrogel contact lenses like Biofinity, Purevision, Acuvue Oasys or Air Optix Aqua. The quality of the solution has an immediate effect on the comfort and length of wearing time of contact lenses, regardless of the type or brand that you wear. Just as individual users display a different degree of tolerance for different brands of contact lenses, their tolerance for different brands of solutions also differs.